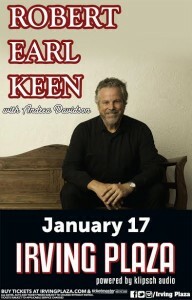 We’re giving away a pair of tickets to see Robert Earl Keen when he plays Irving Plaza on January 17th along with a Robert Earl Keen t-shirt, CD, hat and sunglasses. To enter, e-mail us your name Here by January 16th. Include “Keen contest” as the subject. American singer-songwriter Robert Earl Keen is now three-decades removed from the release of his debut album, with well over a dozen other records to his name, thousands of shows under his belt and still no end in sight to the road ahead. He remains as committed to and inspired by his muse as ever, continuing to amaze audiences nationwide. Don’t miss his show at Irving Plaza on January 17th!